I am totally hopeless at working in the morning. But in the afternoon I am productivity queen woohoo. Really rather monotonous work though, it's just figures after figures that are meaningless to me and acronyms I don't even vaguely know what they could stand for. Had almost zero interest being an accountant previously, now it's like -1000 interest. Lunch every day in the canteen. Canned drinks are only $0.80! How rare is that, in coffee shops everywhere they are sold at $1+. The intern beside me gets up promptly at 5.45pm and leaves immediately haha I am learning fast. Will be doing asset verification next week! A chance to get out of the office at least. 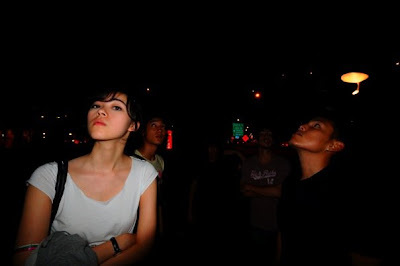 And we're all craning our heads up cause we were below the Singapore Flyer. Popeye's is overrated, only the fries and scone-like thingys are good.